The Stanley Cup’s summer tour has begun, with each player, coach and staff member of the Bruins getting at least one day with hockey’s Holy Grail before training camp begins in Europe. • Bruins owner Jeremy Jacobs took the Cup to Yosemite National Park in California over the weekend before passing it on to assistant coach Doug Houda, who brought it to Whitefish, Mont., on Tuesday. • Nathan Horton, whose Game 3 season-concussion proved to be an inspiration to the team for the Stanley Cup finals, will be the first player to get his day with the Cup. He will host the trophy in mid-July in Fort Lauderdale, Fla.
• After Florida, the Cup will go on a tour of Europe, with Tomas Kaberle (Kladno, Czech Republic) , David Krejci (Sternbeck, Czech Republic) and Zdeno Chara (Trencin, Slovakia) getting their time with it before sending it off to Savonlinna, Finland, where Tuukka Rask will get his day. 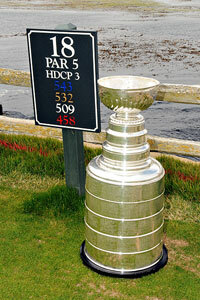 AP Photo/Paul Lester The Stanley Cup spent the Fourth of July holiday on the 18th tee at Pebble Beach. • From there, the Cup will head back to North America, stopping at various locales in Ontario at the end of July. Shawn Thornton (Oshawa), Dan Paille (Welland), Rich Peverley (Guelph), Gregory Campbell (Tillsonburg), Tyler Seguin (Brampton), Marc Savard (Peterborough) and Chris Kelly (Ottawa) will all get their time with it on its Ontario tour. • After Ontario, the Stanley Cup will head to seven other Canadian provinces throughout August. Patrice Bergeron (Quebec City), Mark Recchi (Kamloops) and Milan Lucic (Vancouver) will bring it to British Columbia, Shane Hnidy will get it in Neepawa, Manitoba, Johnny Boychuk will take it to Edmonton, Adam McQuaid will get it on Prince Edward Island, Brand Marchand will have it in Nova Scotia and Michael Ryder will host the Cup in Labrador. • Somewhere along the way, the Cup will stop in Flint, Mich., where Conn Smythe winner Tim Thomas will spend the first of his two days with the Cup. He has previously said he’d also like to take the Cup to Vermont, where he played college hockey. Throughout the summer, the Hockey Hall of Fame will chronicle where the Cup has been and where it's going in this journal.